As 2013 IRA contribution deadline nears, you probably have a few questions about IRA contributions, Roth conversions, corrections, eligibility, and other related topics on your mind. To help you in this busy season, we summarized some of the key IRA issues. Eligible compensation for IRA purposes: Generally, it is earned compensation, i.e. wages, salary, professional fees, bonuses, or compensation received for performance of services. Types of income counted for IRA contribution purposes include: self-employment income, alimony, spousal maintenance, commissions, non-taxable combat pay. Not eligible compensation for IRA purposes: earnings and profit from property, rental income, interest and dividend income, pension and annuity income, deferred compensation, income from partnerships where partner does not perform services that are income-producing, and any amounts excludable from income. Contributions can be made at any time during the year or by the due date for filing tax return for that year, not including extensions. For most people, this means that contributions for 2013 must be made by April 15, 2014, and contributions for 2013 must be made by April 15, 2015. IRA custodians will typically record contributions in the year received. It is account holder’s responsibility to properly reflect and report contributions for tax purposes. When is an individual considered covered by a retirement plan? 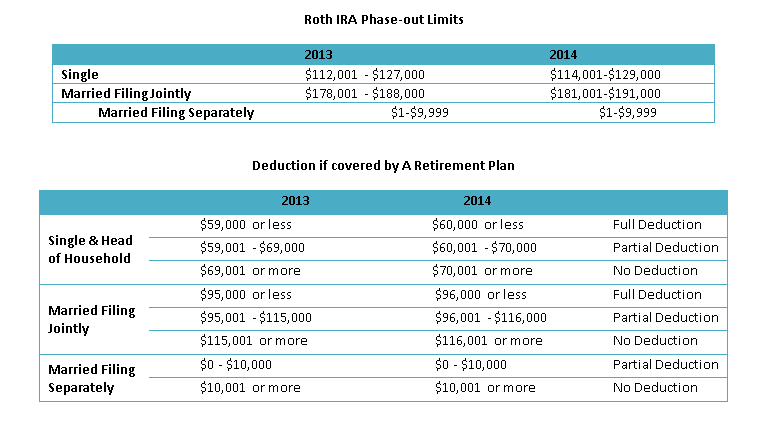 Eligibility to make a deductible IRA contribution in part depends on whether an individual is considered ‘covered by a retirement plan.’ This part can and does get tricky because an individual can be considered as “covered” by the plan at work even if there are no contributions being made to the plan. Under the tax code, as long as the individual is not excluded from the plan she or he could still be a participant even when not contributing. For this purpose a retirement plan includes any employer-sponsored plan, including SIMPLE and SEP IRAs. A way to determine if an individual is considered ‘covered’ would be by referring to his/her W-2’s box 13. Determine whether your client’s contribution is reduced or completely phased out. You can determine that based on his tax filing status and Modified Adjusted Gross Income (MAGI) from the table below. The ineligible amount (part of the contribution or total contribution depending on filing status and MAGI) is called excess contribution and needs to be withdrawn from account, adjusted for earnings, as soon as possible but no later than October 15, i.e. the due date of tax return including extensions for the year in which excess contribution occurred. Make sure to complete the paperwork noting the nature of the distribution so it is coded as a distribution of excess contributions to avoid income tax and early distributions penalties on that amount. A special word about earnings on excess contributions: Any earnings on the contribution will be subject to income tax (and the 10% penalty if y under 59 ½) and must be included on the tax return corresponding to the contribution year. This might require preparation of an amended tax return. Similarly, any losses associated with the withdrawn excess contribution should be reflected on the tax return for the year of excess contribution. Excess contributions are subject to a 6% penalty for each year they remain in the account. That means this problem and associated penalties compound year after year until it is fixed. Failing to report and/or pay the penalty on time could lead to other negative consequences, such as incurring further related penalties and accumulating interest on the amounts owed. If you have a question that was not addressed above, reach out to your Retirement Services subject matter experts via email pensions@firstallied.com or by calling (888) 926-0600. We are happy to help!